Development activities help people develop their skills and capabilities to meet the ever changing needs of business in an increasingly competitive global market. Frustrated with development activities that don’t lead to sustained change? We can change that! At CDE we design and support learning and development activities that help build the internal business capability, skills and talent needed in the organisation. We offer interesting and stimulating training at all organisational levels, using a variety of techniques, such as role play, case studies, coaching, inputs, and quizzes and profiling, to make sure the key messages and changed behaviour get embedded and used in the organisation. At CDE we can help you think beyond the training course! We may well develop a training programme to meet your needs, but we also look at ways to really make the new learning stick back in the workplace. So we may suggest individual development plans cover for example, on-the-job opportunities, peer support approaches, coaching etc. Our primary aim is for the business and the individual to get a return on the investment made, in terms of cost and time – that is, the new skills get used and practiced back at the office. Results! 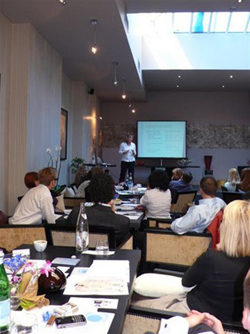 Training is conducted in groups of any size and tailor-made to your specific needs and goals.